Personalized Staplers Custom Printed in Bulk. Promotional, Inexpensive, with Staple Remover. Clear, Silver or Translucent Blue. 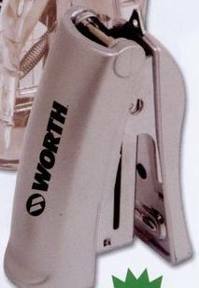 Very sturdy bulk stand up staplers with staple remover, personalized with your logo. We also supply bulk blank (not custom imprinted) staplers for $1.28 each (minimimum quantity: 200). Budget Prices in USA and Canada for wholesale staplers. Our bulk personalized mini staplers come with integrated staple remover and stand up so you don't lose them among the papers on your desk. Free artwork design. Additional Colors: add $0.25 per color, per stapler. Production Time: 7 days after art approval. Rush 3-day and 1-day production are available: contact us. Blank staplers ship next day. Packaging/Shipping Weight: Individually boxed/250 pcs = 30 lbs.